“Nano-technology mainly consists of the processing of separation, consolidation, and deformation of materials by one atom or one molecule”. (Richard Feynman: There’s Plenty of Room at the Bottom, 1959). By definition, nanopharmaceuticals are based on the manipulation of matter with at least one dimension sized from 1 to 100 nanometers, were unique phenomena enable novel applications not feasible when working with bulk materials or even with single atoms or molecules. (National Nanotechnology Initiative, USA) One nanometer (nm) is one billionth, or 10−9, of a meter. Thereby, nanotechnology is defined by size. By comparison: a DNA double-helix has a diameter around 2 nm. On the other hand, the smallest cellular life forms, Mycoplasma, are around 200 nm in length. Poxviruses are exceptionally large viruses, their size is around 200 nm in diameter and 300 nm in length and picornaviruses are around 27–30 nm in diameter. Colloid chemistry. 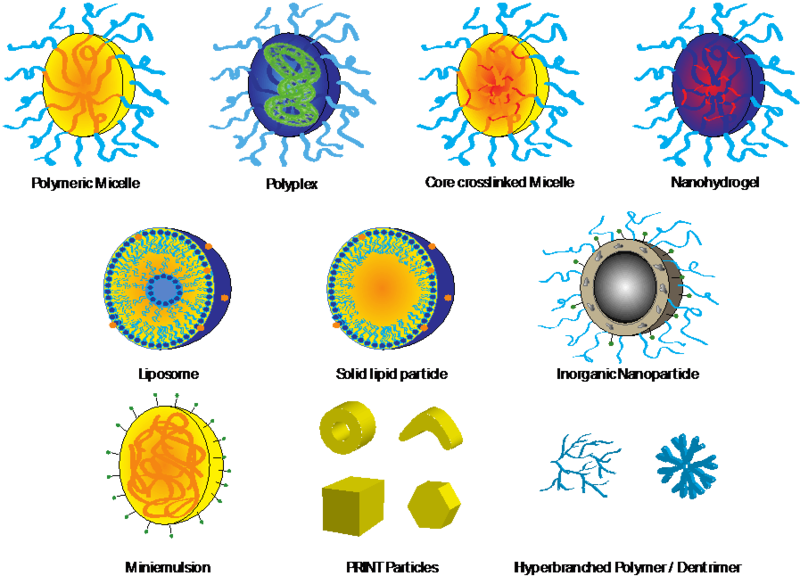 The term ‘nano’ partly masks the good, old colloid chemistry: a colloid is prepared by reducing large particles to colloidal size (between 1 nanometer and 1,000 nanometer), or increasing small particles (single molecules) to the size of colloidal particles. In so doing, e.g., colloidal gold particles mutated to nano gold particles. Fortunately, liposomes still refer as liposomes and not as nano liposomes. In the case of liposomes, these particles can range between 25 nm and 1,000 nm. 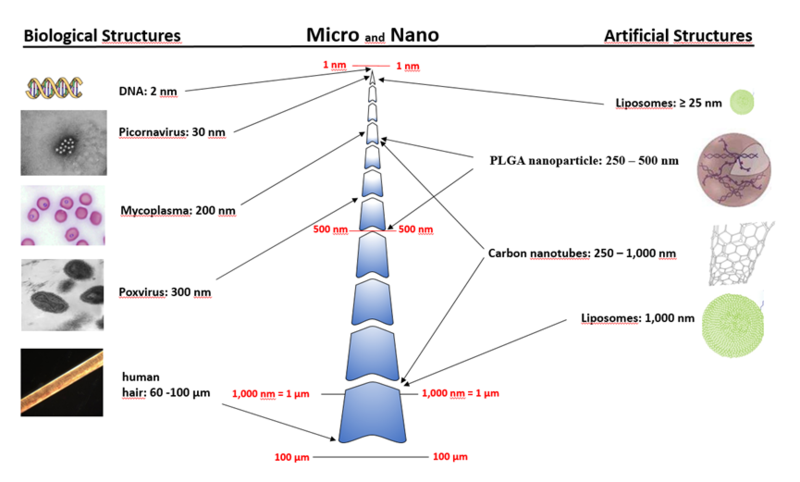 The most commonly used liposomes display a size between 50 and 200 nm. During the last decades, nanoparticles have shown great potential for the application in drug delivery and vaccination, and they are expected to provide solutions to various current issues in this field. The first one is the fundamental problem of solubility: according to Torchilin, about half of potentially valuable drug candidates identified by high throughput screening technologies including those with the highest activities demonstrate poor solubility in water and – for this reason – never enter further development. By encapsulation or binding to a nanoparticulate carrier, this problem can be overcome. Additionally, encapsulation of sensitive agents such as DNA, RNA or peptides protects them against premature enzymatic or proteolytic degradation. In combination with a “stealth” surface of the carrier, which prevents opsonization through steric repulsion, a prolonged circulation can be achieved. Moreover, through chemical modification, defined recognition and site-specific release are possible. One main objective in using nano carriers is to increase the specificity towards certain cells or tissues. This can either be achieved by passive targeting as in the accumulation in well-vascularized tumors driven by the EPR (enhanced permeability and retention) effect or actively by binding of the particles to specific receptors presented by certain cells. Such targeted localization is enabled by functionalizing the particle surface with ligand molecules binding to those receptors, as has been carried out using antibodies, sugar moieties, transferrin or folates, for instance. As pointed out by Little, another promising aspect of nanoparticles in vaccine development is the multiple presentation of subunit antigens. Such synthetic particles can be designed to exhibit a repetitive orientation of the antigen on the surface, giving the potential of generating B-cell receptor crosslinking and enhanced activation. 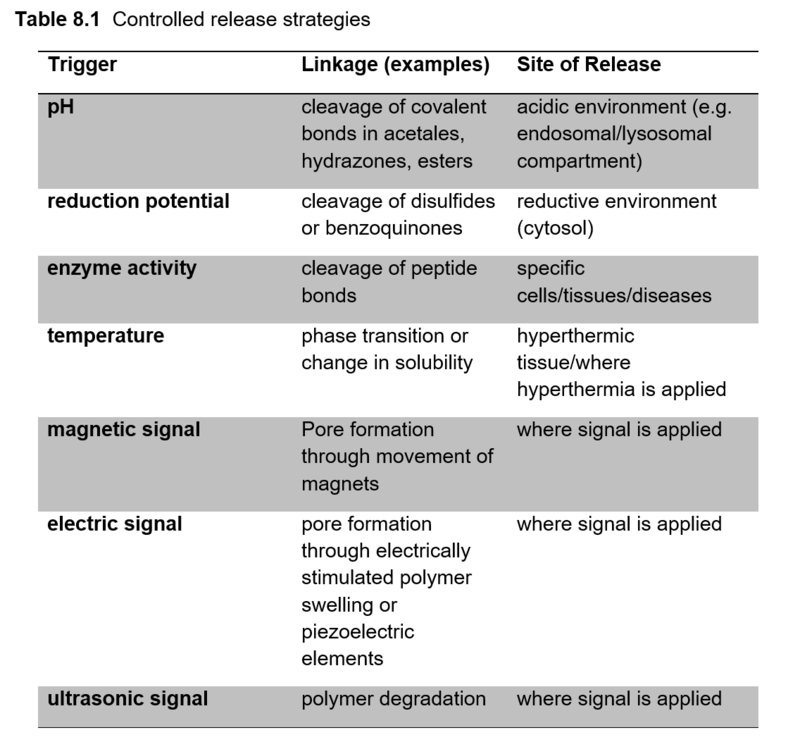 Among the most frequently used systems are liposomes, solid lipid nanoparticles (SLNs), immunostimulating complexes (ISCOMs), micelles, hydrogels, polymer colloids prepared by miniemulsions and polymer nanoparticles such as those fabricated by particle replication in non-wetting templates (PRINT) (Figure 8.2). Big potential for nanoparticulate vaccine formulations most likely lies in cancer immunotherapy. In addition to this, applications for vaccination against various infectious diseases are investigated. These include for example nanoparticle-based vaccines against influenza, West Nile encephalitis and malaria. The components of a typical nanoparticulate vaccine formulation combine an antigen (T cell and/or B cell epitopes), adjuvant and targeting moiety on one particle. A wide variety of antigens such as peptides/proteins, lipoproteins, glycopeptides, tumor-associated carbohydrate antigens (TACA) and carbohydrate mimetic peptides are tested in combination with nanoparticulate carriers.